I'm currently in beautiful Tasmania for Christmas as my mum moved down here about two years ago now. She lives in a small town close to Launceston, however my flight landed in Hobart because of plans that fell through so we had to drive the 4 hour journey from Hobart to my mum's house which meant we stopped off along the way. 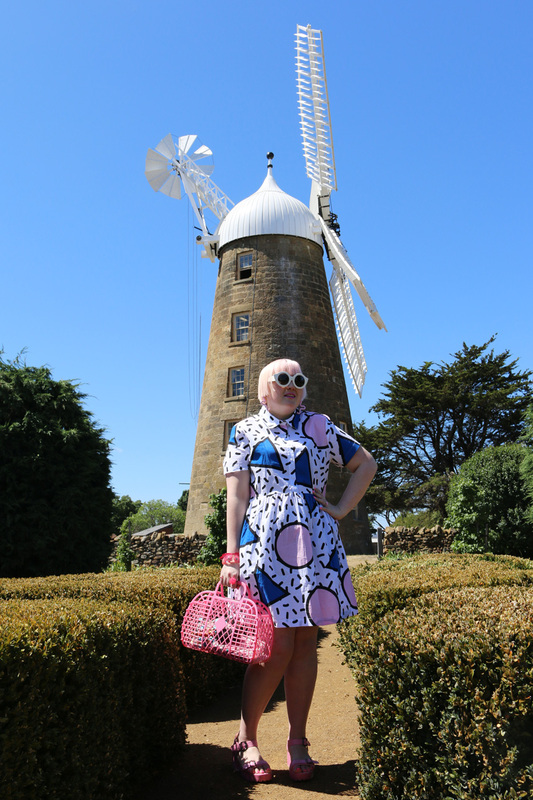 Our first stop was Oatlands, a picturesque village which wikipedia says is "considered to have the largest number of colonial sandstone buildings in any town in Australia" which probably is true as there are a lot! 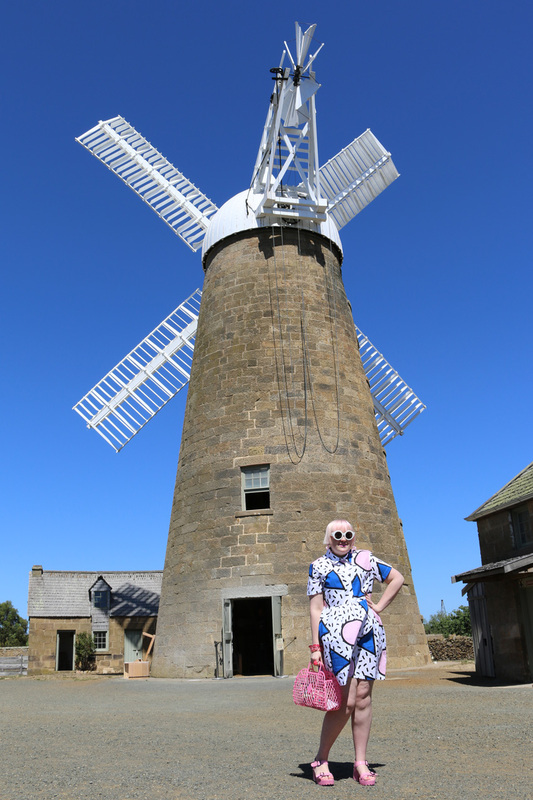 The main attraction of the town is Callington Mill which was built in 1837 and is the only mill of it's type in operation in Australia. It's a pretty place to explore with a cafe, garden and their own brand of flour made on site! 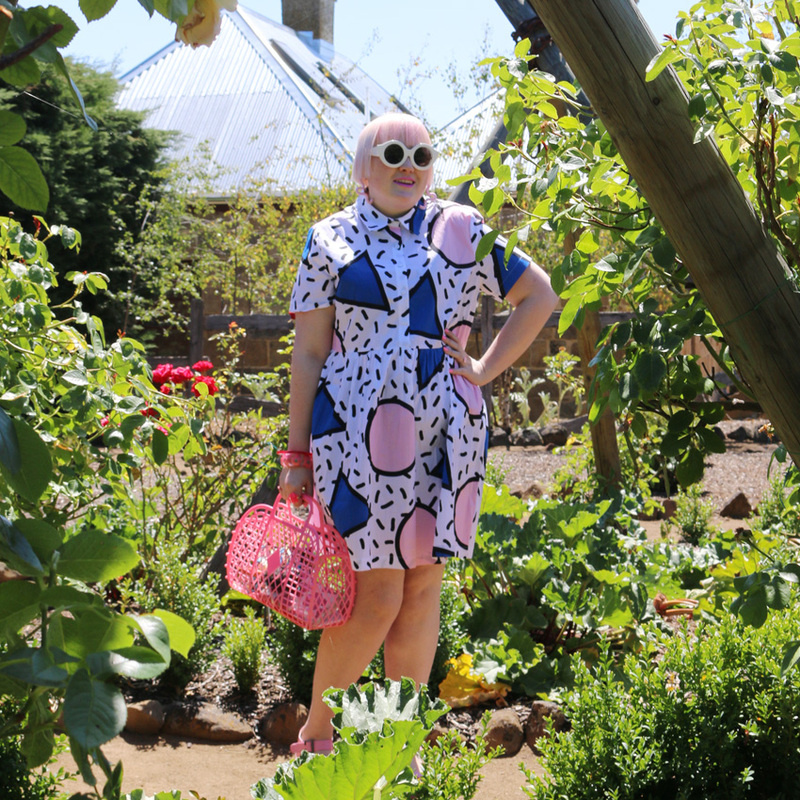 To be perfectly honest with you I didn't wear this outfit on the plane, but as we had my suitcase in the car and the location was so stunning I made a quick outfit change in the car and my mum took these snaps for me. 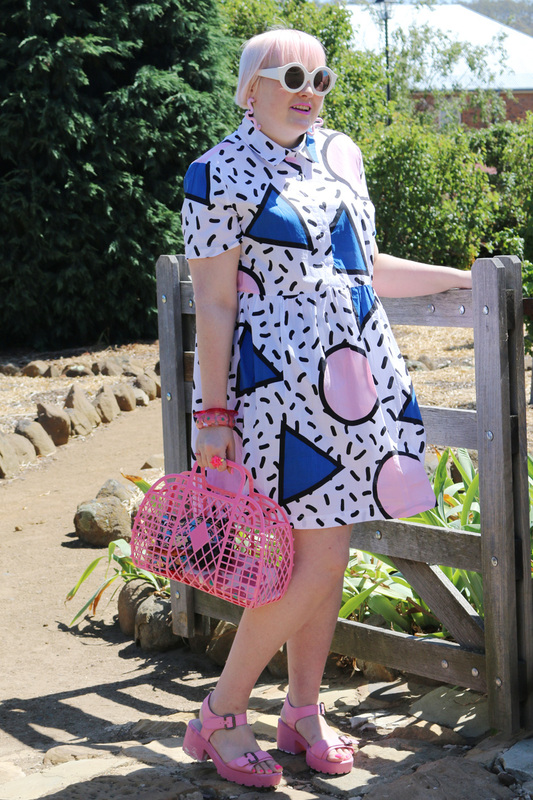 I'm so in love with this dress and the whole Camille Walala for Gorman collection. 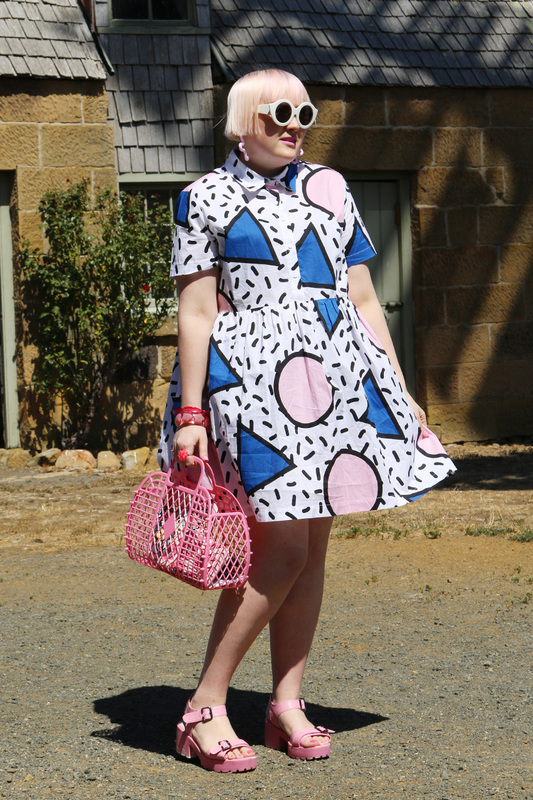 I used to live next to a huge Camille Walala mural in Fitzroy, in fact I used it as the location for outfit photos in the past. I was pretty bummed to miss out on the collection's launch whilst I was in Tokyo and the chance to meet Camille in person but oh well, these things happen. I was hoping and praying that the pieces I loved wouldn't sell out before I got home as I wanted to try them on before I bought them and I'm so happy I was able to get this dress, it was apparently the last left in my size in the state so I was very lucky. I just love the print and the cut, it will be great all summer long and then paired with tights and my pink leather jacket for winter - YAY! My mum really got into the photography haha. These Kitsu earrings are my LIFE right now. 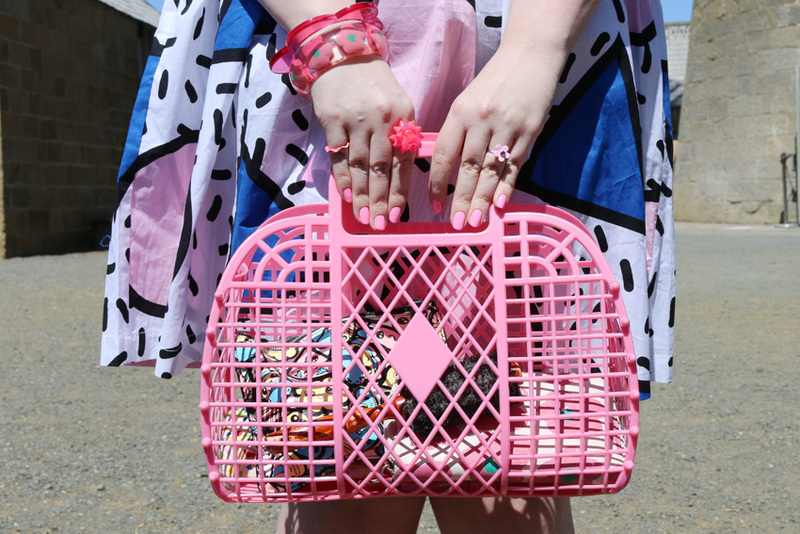 All Kitsu jewellery is hand made ethically in Melbourne. These earrings are the thing of dreams. 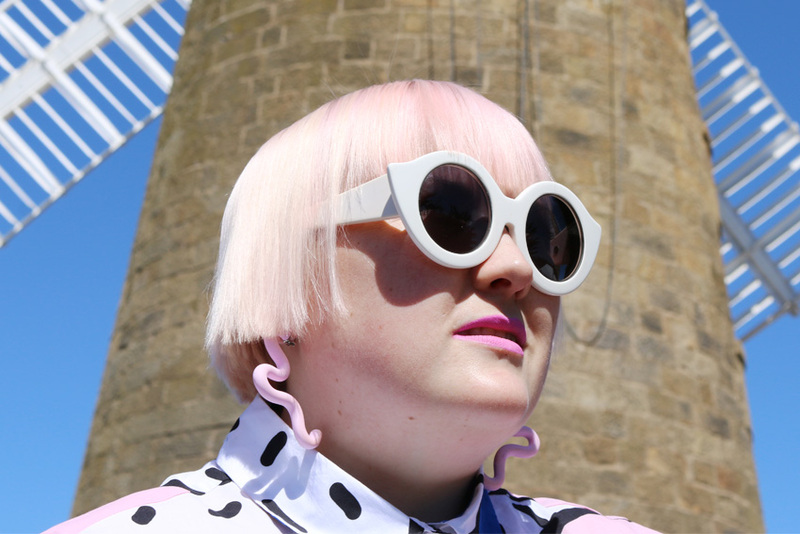 The designer was able to make me specially made clip on ones as I don't have my ears pierced which was so lovely and I wore them daily in Tokyo to many many many complements. Not going to lie, kinda hate that the pink has rubbed off all over these shoes. But they were cheap so what you gonna do? Quick thinking on your part Hayley, and cool outfit! Wow, I've driven between Hobart and NW Tassie thousands of times (my family lived on the NW coast and I went to uni in Hobart) and always said I'd stop along the way at the small towns but never have. Fantastic outfit! Do you have trouble keeping clip on earrings on? I got some pierced earrings recently but it's so long since I wore any, my piercings have completely grown over and I'm not sure I can bother piercing them again. I might just go the clip ons. Head to toe, love the outfit! I love the print of the dress, and actually spotted a girl about town rocking the jump suit. Its the kind of print that makes you happy and really stand out in a crowd. Overall super cute outfit gurl!!! !